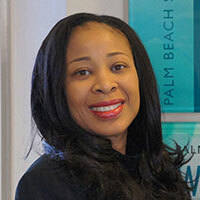 Dr. Tunjarnika Coleman-Ferrell, who was first introduced to Palm Beach State College as a student participant in a summer program more than two decades ago, has been named dean of academic affairs at the Boca Raton campus. She was promoted to the position after serving four years as associate dean for science, technology, engineering, mathematics (STEM) and computer science. Prior to that, she served as a department chair for six years, overseeing health sciences, physical education, psychology, developmental education and teacher education. Coleman-Ferrell joined Palm Beach State as a professor of teacher education in 1998 after working for more than two years as a middle school teacher of business and computer application classes in Broward County. However, her connection to PBSC dates further back. She was a new graduate from Palm Beach Gardens High School when she participated in Fast Break, a summer program at the College that allows students to take courses before starting their freshman year. She completed her bachelor’s degree at Florida Atlantic University. While attending FAU, she sometimes took classes at PBSC and was also employed as a student worker. Coleman-Ferrell, who also teaches part time in FAU’s Department of Educational Leadership and Research Methodology, has presented at several state, national and international conferences on such topics as technology, professional development for teachers and administrators, and multicultural education. She currently serves on a host of committees at the K-12, college and university levels. In addition, she is the chair of the Administration Commission for the Association of Florida Colleges, representing all administrators at the state level. She has won several awards, including the PBSC Gimelstob Professor of the Year Award in 2005.